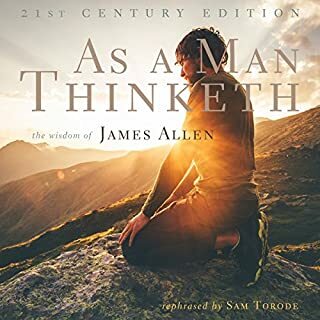 Widely considered the greatest self-help book of all time, As a Man Thinketh reveals how our thoughts determine our character, circumstances, health, appearance, and achievements. The choice is yours: Either master your mind to create the life you want, or remain mired in frustration and failure. In this 21st-century edition, best-selling author Sam Torode entirely rephrases Allen's ideas in contemporary English, making his wisdom available to today's listeners. I enjoyed this book and the content really fits what I am working on in life right now. I did the personal exercise at the end and really enjoyed doing so. Keeping my hand firmly on the vision of thought. If you’re looking for some inspiration and clarity. Give, As A Man Thinketh, a read.